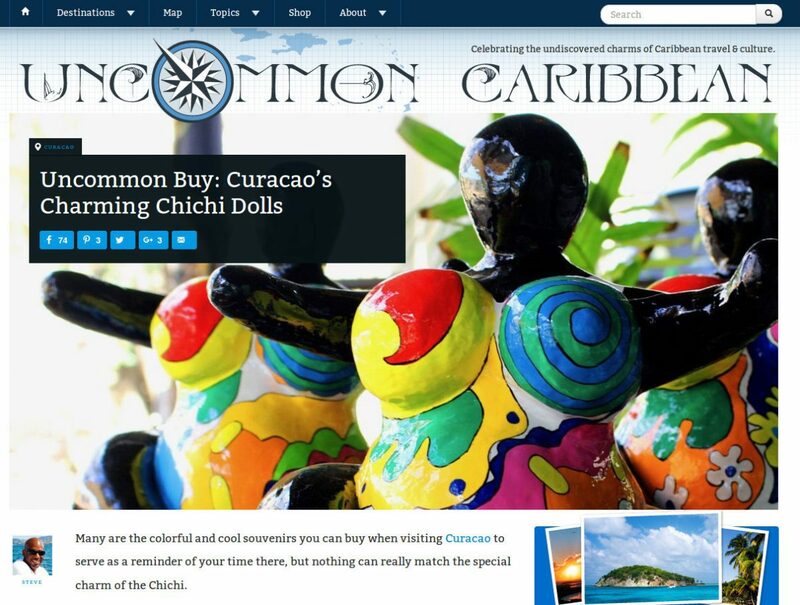 Steve Bennett writes about the charm of the Chichi on their Caribbean Travel Blog: Uncommon Caribbean. Many are the colorful and cool souvenirs you can buy when visiting Curacao to serve as a reminder of your time there, but nothing can really match the special charm of the Chichi. These things are more than just simple dolls; more than just whimsical pieces of art. Chichi dolls carry deep symbolic meaning. The proof lies in the name, “chichi,” a word borrowed from the uniquely Dutch Antillean language of Papiamento, a mix of African dialects, Dutch, Spanish, English, Portuguese, and native Amerindian only spoken in Curacao, Bonaire, and Aruba. In Papiamento, “chichi” refers to older women that young people hold in high esteem. Maybe it’s a favorite aunt, an older sister, your mom, nana, or a female family friend, if you turn to them for advice and guidance in Curacao, then they’re your chichi. Transplanted German artist Serena Israel dreamed up her Chichi dolls soon after arriving in Curacao in 2001 while leading a workshop celebrating the female form. The over exaggerated breasts and buttocks characteristic of every Chichi didn’t strike a chord with all local Curacaoans at first, but the dolls themselves and meaning behind them soon won most people over. What I love best about the Chichi is that you can personalize ’em to best reflect the special chichi’s in your life. You can do just that during regularly scheduled workshops held at Serena’s Art Factory, the number one destination on my list for my next visit to Curacao where I hope to create a Chichi of my mom. Learn more about Serena, her workshop, her amazing world travels, and famous Chichi dolls here.